I had not visited New Orleans in at least six years, maybe seven. It seems every time I go—and that’s five or six times over the past 25 years—the main reason is to attend a conference, and every time that means four or five days in a big hotel adjacent to the French Quarter. In some ways one can not ask for a better location—if you have to be based in a big anonymous hotel, at least be in a city that understands the concept of “hospitality.” And if you have to be based in a high-tourist destination, at least be in an area where one can quickly move out of the stream of revelers and trinket hunters and find the colorful gables, odd rooflines, exquisite ironwork and occasional snoozing cat that give the residential areas of the Quarter its true charm and sense of history. And if you are confined to the urban south, be a spitting distance from where the finest oysters, shrimp and pompano are pulled from the water and invariably served as Cajun nectar. Hurricane Katrina devasted a city and its culture, but not the spirit of New Orleans. Two years later, there is much rebuilding ahead and some parts of the city may never get that far. The Quarter was largely spared in terms of physical assault—many buildings were dilapidated pre-Katrina, and some now sport new paint and other improvements. Many remain on lists of Historic Preservation societies and many look to be beyond preservation or caring. By and large, the French Quarter remains charming in its combination of Old World elegance and New World funkiness, streets clean and clutter free only a day past Mardi Gras, catching its breath for a couple of days before the weekend brings a new wave of conventioneers and off-season tourists to check out the din of music on Bourbon Street and the slurpy tang of oysters on the half shell. I expected to see more remnants of Katrina enroute to my convention’s service project, the building of a playground at an “uptown” elementary school. The neighborhood had few resources, few bright spaces, but a schoolyard full of enthused teachers, AmeriCorp workers and volunteer school psychologists –including many graduate students-- in town for our national convention (of the National Association of School Psychologists). Turned out this was not an area particularly overwhelmed by the hurricane but more basically hit by poverty. A large area that should have been a playground was a mass of cracked asphalt with a few rusted basketball hoops. About five hours later, that asphalt would be covered with bright primary colors marking off game areas and Four Square courts, a thick layer of mulch would cushion an area around slides and climbing apparatus. KaBoom! 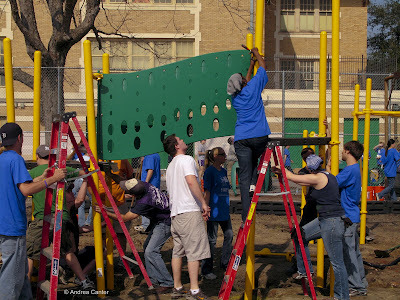 is a nationwide project that provides designs, training and supervision for the construction of playgrounds for children who otherwise have few options for outdoor fun. They find a sponsor like the NASP Children’s Fund to provide the financial resources and manpower. We drove back downtown trying to imagine the moment when several hundred youngsters would burst out the school door and see that special gift for the first time. I would have loved to have been a bird on the swing come Monday morning.